The excellent folks at The Nation (who published my first-ever piece of labor journalism) have an excerpt from Necessary Trouble up, as the book continues to roll on. Jaffe delves deeply into the nuances of American capitalism throughout the book, providing the reader a roadmap to understanding the rebirth of American activism. She saunters through a short history of Walmart, the retail giant which has effectively been able to set substandard labor practices by very virtue of its size, and the efforts to organize its employees. She also explains and shows how credit has been used as a crutch to stave off stagnating wages since the 1970s; and she rightfully connects disastrous austerity policies in the European Union to the policies pursued by conservative statehouses across the United States. Read the rest at Jobs With Justice. Yet with the election looming, Jaffe’s “Necessary Trouble” reminds us that even now the political stage is much wider and richer than pulling a lever every couple of years, choosing between candidates whose differences increasingly have more to do with labels than politics. We have more options than what’s on offer. Contrasted with “Against Democracy,” which works out far better than I would have expected. Read the whole thing here. So pleased that Necessary Trouble made the New York Times Book Review editors’ list of nine books for back-to-school reading! Excellent company, too. 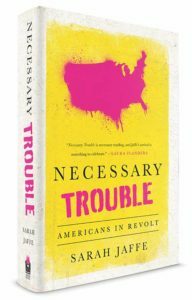 NECESSARY TROUBLE: Americans in Revolt,by Sarah Jaffe. (Nation Books, $26.99.) Jaffe examines the rebirth and re-envisioning of activism over the past decade by groups on both right and left. There’s a reason for all the tumult. Necessary Trouble, Press necessary trouble, reviews Leave a Comment on 9 Books for Back-to-School That Times Editors Think You Should Read: More love from the NYT! My former AlterNet coworker Tana Ganeva helped launch The Influence this year, and she and I sat down last week to talk Necessary Trouble and why some people take action and others fall into despair. I wanted to talk about the Deaton-Case study that found lower-middle-class and poor white people are basically dying from alcohol, drugs and suicide. Earlier you mentioned that the media is shocked that people are still angry. And it seems like there are parallels. When this study came out, it seemed like everyone was shocked that people are basically killing themselves, slowly or literally. It seems like the same factors that drive some people to organize movements drive others to despair. It’s absolutely true. When you’re struggling, you have a couple of options. For example, I talked to mostly older women near retirement age facing foreclosure. They talked very movingly to me about the shame that they felt, and about the despair and the fear and how hard it was for them to ask for help. But these are the people who did ask for help. They really got motivated and took action and they were lucky enough to find somebody that was doing this work in their neighborhood in Atlanta. But if you live in Ripley, Mississippi and you’re facing foreclosure, and there is no Occupy Our Homes to come help you, can you feel like you’re not alone with your problems? Can you feel like your problems aren’t personal failings? The wonderful folks at Moyers & Company have excerpted my chapter on one of my greatest obsessions, the Red Scare. To Sawant, the victory showed that her message, and its appeal to the working class of a wealthy city, had resonance. “People don’t need some kind of detailed graduate-level economics lesson; they understand that the market is not working for them. The market is making them homeless. The market is making them cityless. And they’re fed up, and they’re angry.” Angry enough, it seemed, to take a leap of faith and support a candidate whose ideas had only recently been presumed to be unthinkable. I wrote an op-ed for Time that sums up the argument of Necessary Trouble. Read the rest at Time. Truthout has been running my stories for quite a few years, supporting my coverage of the Chicago Teachers Union, my trips to the Rockaways after Hurricane Sandy, my long-form reports on what happened after Occupy, and much more. Necessary Trouble is a Progressive Pick at Truthout, meaning that you can order the book through them and donate to progressive reporting (including my own). Joe Macaré interviewed me about the book, the writing process, the value of electoral politics, and more. You also show how white people’s reluctance to acknowledge racism as an issue has caused setbacks, from labor’s Operation Dixie to Oath Keeper groups that split over whether or not to show solidarity with Black protesters in Ferguson. What have been the hallmarks of movements and campaigns where solidarity across racial lines has been possible? My favorite example is in Robin D.G. Kelley’s Hammer and Hoe, a book everyone should read about the Communist Party in Alabama during the Depression years. The Communist Party had a lot of problems in the US, but what it did in the South, particularly, was take the struggles of Black workers and Black sharecroppers as key to the class struggle it wanted to wage in the US. So the Communist Party in Alabama was made up of those workers, and they fought against lynching and police violence and false arrests alongside labor struggles for fair wages and equal treatment and inclusion for Black workers in unions. That wasn’t a sideline struggle, it was the struggle. I was saying that we tend to personalize racism. We think of racism as people who say racist things or join racist groups or show up at a Trump rally with a sign saying “Build the Wall.” We don’t think of racism as where houses are built, what kind of a mortgage you get and what kind of air you breathe. We spend a lot of time trying to cleanse ourselves from the original sin of racism rather than trying to come up with ways to fight to change the systems that maintain it. Read the rest at Truthout. I can’t say enough good things about David Dayen–he’s generous with his time, knows more than any human should about the inner workings and scams of finance capital, he wrote an incredible book (buy it now, seriously, you will not regret it) and now he’s written a lovely piece on my book at TNR, connecting it to the launch of Bernie Sanders’s “Our Revolution” and the question of where the energy goes next. We had a great phone chat about it all last week and some of those thoughts make it in here, too. The point that Jaffe’s book underscores, ultimately, is that “politics” as practiced in America has never been confined to Election Day or a single vote in Congress. Turnout cratered in the 2014 midterms, Jaffe notes, at the same time protest movements expanded nationwide. The activists Jaffe profiles are not bound by the realities of counting votes on Capitol Hill or maximizing donations. They see their goal as envisioning the world they want, and making those in power uncomfortable until they get it. The vehicle for that will not be “Our Revolution” delivered in 30-second ad bites, but a sustained movement, 24 hours a day.